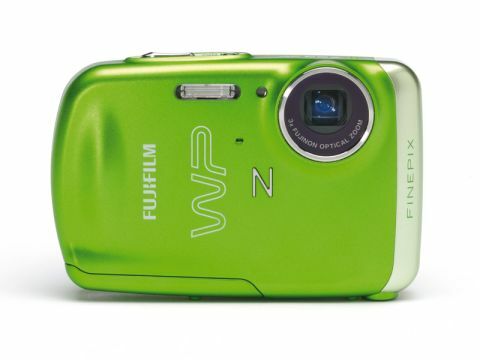 The FinePix Z33WP is fun, fashionable and inexpensive. Its depth rating (limited to 2 hours) is just 3m, though, and it's neither shockproof nor freezeproof. But it is ideal as a 'beach' camera for family holidays. There's no conventional navipad; instead, the directional buttons are integrated with the rest in a grid. The buttons have a pretty heavy and vague action, too. The zoom is quite slow, despite having only a 3x range, and the Playback mode is even slower still. The detail is in fact pretty soft. It's OK for snaps and medium-sized enlargements, but the other cameras on test are sharper. The colours have a bit of a blue tinge, and the little Z33WP did underexpose our test shot somewhat.